An exhibition of new paintings and drawings by Brice Marden at 522 & 526 West 22nd Street. Matthew Marks is pleased to announce an exhibition of new work by Brice Marden in his galleries at 522 & 526 West 22nd Street. Including ten paintings and twenty-five drawings, this is the artist’s first exhibition of new work since 2012. 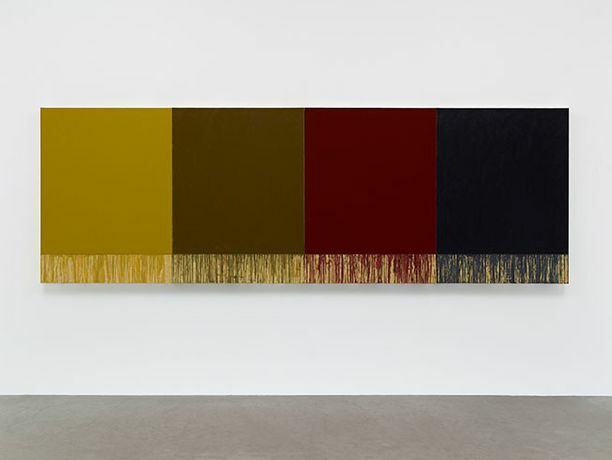 Eastern Moss (2012–15) is a monochrome painting in nine joined panels, each a different shade of terre verte, or green earth, a pigment commonly used in underpainting during the Renaissance. Terre verte also figures in two single-panel monochromes whose composition — a large rectangle or square resting on a smaller rectangle — recalls Marden’s early paintings and drawings, particularly their disclosure, in the lower rectangle, of the many layers used to build up the painting. This same composition also appears in four multipanel paintings, each based on the four seasons, a theme Marden first explored forty years ago. His return to the monochrome is a significant development for an artist who has spent the past three decades engaged with the calligraphic line. Included in the exhibition is a twenty-foot-wide painting made up of calligraphic and monochrome panels side by side — a first for the artist. Just as Marden’s experience with line has altered his new monochromes, the reverse is also true: “What’s happening with the monochromatic paintings is that I’m getting certain colors I never got. And now I can use those things in the calligraphic paintings.” This shift is evident in the Nevis Stele paintings (2007–15), each five feet tall by three feet wide. With a palette of muted reds, blues, greens, and grays, the works are inspired by Chinese steles — monumental stone slabs carved with religious inscriptions dating back to AD 800. The exhibition also includes a number of calligraphic drawings, including a group of twenty works Marden began in Tanzania. Though the marks in these African Drawings vary from character-like forms to thick nets of multicolored lines, each composition is based on the same fifteen-by-fifteen grid. Accompanying the exhibition is a clothbound catalogue featuring an interview by artist Matt Connors and full-color reproductions of over sixty works. Brice Marden (born 1938) lives and works in New York. His work was the subject of a 2006 retrospective at the Museum of Modern Art in New York, which traveled to the San Francisco Museum of Modern Art and the Hamburger Bahnhof in Berlin. He has also had one-person exhibitions at numerous international museums, including the Solomon R. Guggenheim Museum in New York, the Stedelijk Museum in Amsterdam, and the Tate Gallery in London. Brice Marden: New Paintings & Drawings is on view at 522 & 526 West 22nd Street from November 7 to December 24, 2015, Tuesday through Saturday, from 10:00 AM to 6:00 PM. For additional information, please contact Jacqueline Tran at (212) 243-0200 or jacqueline@matthewmarks.com.